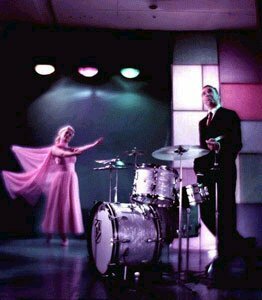 Conover: On today's program we're going to compare the work of two of the world's greatest and most famous drummers: Buddy Rich, whose fame is not limited to his drumming, but also (extends) to his orchestra's and to his work as a dancer, a singer, and an all-round entertainer; and Gene Krupa, who, of course, has not only been a drummer in other men's orchestras, but has been a leader of his own orchestra, one of the world's finest, which has introduced many of the great stars we all recognize today. To begin our survey of Gene Krupa, let's go back to the Carnegie Hall Jazz Concert in which Gene Krupa soloed and starred with the Benny Goodman Orchestra. Gene, I suppose this was a tremendous occasion to look forward to when the Goodman band finally made the hallowed halls of Carnegie Hall. Conover: And how many times did you return to Carnegie Hall in the Goodman Orchestra? Krupa: Oh, that's like...oh, with the Goodman Orchestra Just that one time; but I've been there many, many times since with Jazz At The Phil. Conover: Jazz At The Philharmonic has been an unusual experience, for, I suppose, everyone who has joined the Norman Granz troupe. Krupa: Yes, I'd say It's about the best job in the world today (chuckling). 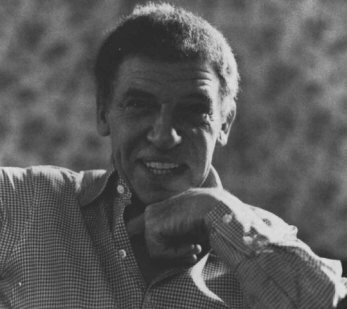 Conover: Do you feel happier starring with the other great stars, rather than leading your own orchestra? Or is there a mixed emotion there, Gene? Krupa: Well I guess I like variety pretty much, but I do enjoy this work very much. Particularly with Buddy on the gig, we get a chance to knock each other out It'just wonderful. Conover: Well, do you want to set the stage for the famous performance of Sing, Sing, Sing? Krupa: Introduce the guys in the band, or what? Conover: Why don't you speak of the guys in the band and also your impressions as the curtains opened and you saw the audience out front and you realized what could happen. 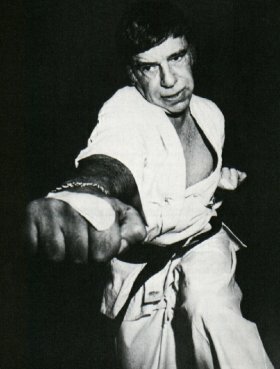 Krupa: Arthur Rollini. uh...gee, I th-Billy Depew, I think on saxophone. I can't remember the other guys, but that's enough, right there. Uh, I guess we started off a bit shaky. If I remember correctly, the first tune was "Don't Be That Way, " but the one you are going to listen to now we're into it already and the nerves more or less have worn off So, uh, here it is, "Sing, Sing, Sing." Conover: Gene, how did it feel when you finally left Goodman and formed your own orchestra? Was there a sort of shakiness about invading the bandleadership field? Krupa: No...I feft pretty confident, I guess as a result of the sales talks all the various agencies gave me, and they showed me big fat contracts and everything, so it was, uh...I wasn't too scared about that really. Conover: I know you made a point of getting the finest stars around to work with you. Krupa: Yes, I've had some pretty good luck finding wonderful talent. Just a few of 'em, the musicians are Roy Eldridge, Charlie Ventura, Vido Musso, Sam Donahue, Charlie Kennedy, Red Rodney- oh, I could go on for a long time. Some of the better singers were Anita O'Day, Johnny Desmond, Dave Lambert, Buddy Stewart, and of course the arrangers who were largely responsible for a wonderful book, were Jimmy Mundy, and, uh, Ned Hefti, Benny Carter, George Williams and Gerry Mulligan. Conover: How many sides have you put out as a bandleader? Have you ever counted them up, Gene? Krupa: Good gosh, I never counted, but I guess about three or four hundred. Conover: Gene, what was the first time that you heard Buddy play? Krupa: Uh...actually, I heard Buddy play when he joined Tommy Dorsey's orchestra in - I Don't know exactly when he joined, but this was in, I'd say, 1939. At the Palmer House in Chicago. And the only reason I didn't hear him before then was I was scared to death. Because the guys in Goodmans band - like Harry James and all the chaps used to come by and say,"Man, this kid over at the Hickory House is going to scare you to death. Wait till you hear him. I'm often asked the question, particularly since I've gone into the drum school business, along with Cozy Cole, we have a studio in New York - I'm very often asked "How about natural talent against studied technique and so forth?" Well, I've watched everybody rather closely, and there are three giants in the drum world and of these three Buddy stands out head and shoulders. 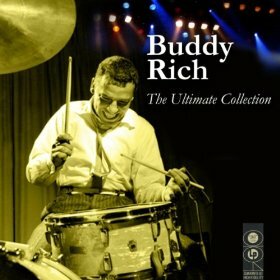 They are Buddy Rich,Ray Bauduc and Ray McKinley. When I speak of natural drummers I'm talking about guys who are playing with the talent god gave 'em. But here's an amazing thing. While this isn't true of Ray-McKinley or Bauduc-It's true of Buddy. You can watch Buddy play and actually if you watch him, You'd think he's the most studied person in the world. And even Buddy himself will make something - like, we'll be in the dressing room, He'll pick up a pair of sticks and say: "Well what is this?" And he'll rattle a little bit and actually, If you break it down, get him to do it slow enough, I can name it. I can break it down into whatever it is. And inherently, naturally, He fingers all these things correctly. Now I now why this is. But let me tell you something. 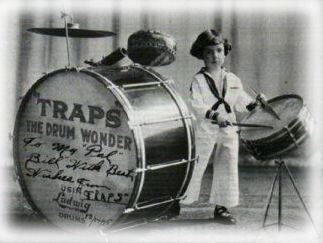 No doubt when he was a young child he doesn't remember this, He told me himself when he was a young child and sanding around for his daddy to rehearse his act in the old vaudiville days,well those old pit drummers where just wonderful. Every one of 'em. Well now y'know, this little kid standing around? He's got to absorb all these things. That's how come the wonderful left hand. That's how come the great ambidexterity which is absolutely necessary for a good drummer. To me he's the greatest. Conover: Buddy, what's your rebuttal to that? Or is there? Is "rebuttal" the word? Rich: Well, now, you put me in a very embarrassing position. I don't know how to answer a thing like that. That's probably the greatest compliment that has ever been paid me by anyone, especially when it comes from such a giant as Gene. Because, as anyone knows, anybody that knows anything about drums - and this is not going to sound like an Alphonse and Gaston type reply - uh...Gene is absolutely the first man when it comes to drums. The inspiration for every big-name drummer in the band business today, I think. 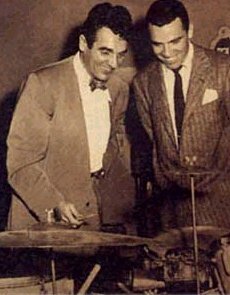 I think at one time every drummer in the business today, at one time wanted to play like Krupa or wanted to win a Gene Krupa drum contest. This is the big inspiration for drummers and naturally it has to be the same way with me. After hearing Gene with Benny for so many years and listening to the recordings and everything, uh, this is the guy the kids want to play like more than anybody else. And just like anybody else the same goes for me. This is my man and, uh, you can't say any more. This is the President. And, uh, that's it. Conover: Well, how do you agree with Gene's definition of intuitive or natural drummers as against trained or studied drummers? Conover: He has put you in the "natural" drum class. Rich: I'm a lucky one see? I think - and I think Gene will agree - I think to be an expert at anything. I think the best thing to do is study. Iv'e tried, but I'm to stupid. I can't sit own long enough to absorb any kind of learning. At one time I wanted to play like Lionel Hampton. I went out and bought myself a set of vibraphones and hired a great teacher, and after about three weeks I never saw the vibraphones again because I just couldn't absorb the things I was being taught. But I think any young drummer starting out today definitely should get himself a great teacher and learn all there is to know about the instrument that he wants to play. 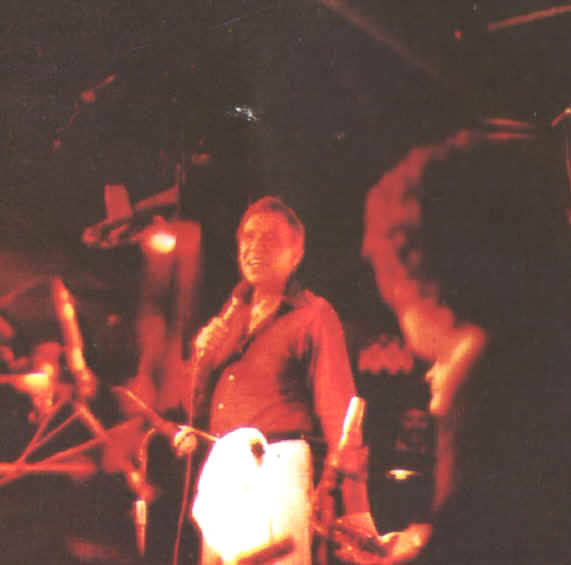 Conover: Well, do you agree with Gene's selection-excluding yourself, out of modesty of course - of the greatest drummers today or the greatest drummers of the past? Rich: He left out two of my boys and I'm sure they're his boys, too. Conover: Can I see if I can name them, 'cause you've never mentioned this before? Conover: I would say Jo Jones and Sid Catlett. Now maybe I'm wrong. Rich: Well, Sid Catlett of course deserves to be in that company. But he left out CH - the daddy of 'em all. Rich: Chick Webb' But of course Jo Jones. 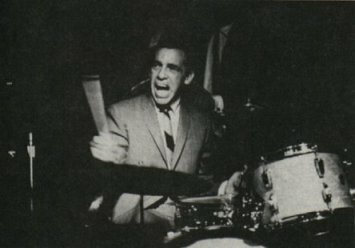 My all star poll for drummers would be Gene, Jo Jones, Chick Webb, McKinley, Bauduc and Catlett. Those...everybody had a distinctive style, and certainly great technique, and they could sure swing a band. Conover: Well, since both of you were, uh, already in the prime before many of the young drummers of some of the new movements in jazz came along, uh, you've been in a good position to get an opinion of how the drummers such-well I won't mention names because I don't know what your answers are going to be, but how those drummers compare both with the drummers before - or who were established before - and also in relationship to the music that they're playing today. Krupa: Mm-hmm. Well, Willis, I'd say that the "new music" actually hasn't found itself enough yet to...to...to showcase a drummer Do you agree with that case Bud? 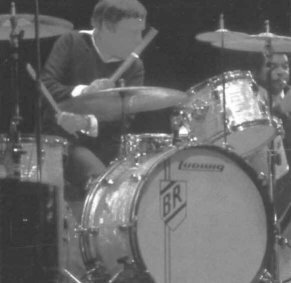 Rich: I have definite and very set opinions about the so-called modern school of music and drummers.Whereas in the days when it was necessary to swing a band, where a drummer had to be a powerhouse,today more or less the "cool school" has taken over, and I don't think there is such thing as a cool drummer. You either swing a band or don't swing a band and that's what lacking today. There aren't any guys around who get back there and play with any kind of guts. And I like heavyweight. I'm not a flyweight. I like - in my fighting, I like heavyweights and in my music I like emotionally good, strong heavyweight type of jazz. And its just lacking today. Conover: Well, how do you feel about the idea of drums used almost as a melody instrument rather just as a rhythmic instrument? Rich: Well, it would be very nice if you could play a melody on it. But primarily, the drummer's supposed to sit back there and swing the band. Am I right? Rich: (Laughs). And some tunable tom-toms. 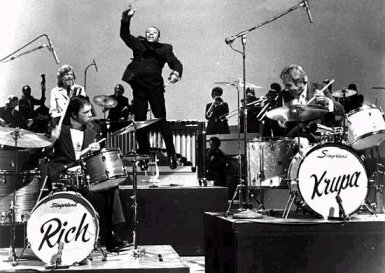 Rich: I think the drummer should sit back there and play some drums, and never mind about the tunes. Just get up there and wail behind whoever is sitting up there playing the solo.' And this is what is lacking, definitely lacking in music today. Krupa: Well that's Buddy's big...big tip.I mean, uh, he can play so hard, and yet make a sound, rather than a, a, a noise. Krupa: Well you know the nice thing about it? They're not set up! Conover: There's no agreement in advance? Rich:And they never will be because then it would get to be kind of stiff, boring kind of thing. I think we get up on the stand every night and we look at each other and you listen to all the comments that come at you from the audience. Naturally, they're partisan groups and they're all shouting for their favorites, and we sit down at the drums and we laugh, and some nights Gene'll start a tempo or other nights I'll start the tempo. And we just start to play. And some nights it's great, and other nights it's laughs, and other nights it's boring, because that's what makes anything that's spontaneous is a - it's a free feeling. We get up there and play just exactly what we feel that particular night. When we play places like Carnegie Hall where the places are sold out we know that people are listening uh, we play good. We play other places where we don't think there's too much interest - rather than listening I think the people would just rather be heard themselves so we let them scream and we play under them. Rich: But we have...we have a ball doing it. I'm sure that Gene will say just about the same thing. Krupa: I'll bear you out, Bud. Sure. 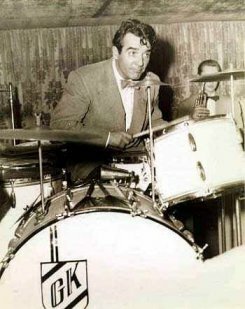 Conover: Well, let's listen to one...one of a number of drum battles, or let's say happy challenges, between Gene Krupa and Buddy Rich at the drums. Gene and Buddy, it's been a pleasure having you with us for the full hour today. Rich: Well, it's been a great pleasure to be here with you, Willis. And we hope everybody listening enjoyed it half as much as we've enjoyed being able to sit down here and talk with you, and talk with Gene, and really get to feel free to express exactly what we feel about each other. It's been a kick.